"Heaven has no rage like love to hatred turned, nor hell a fury like a woman scorned," said an old dead English dude. Want proof? 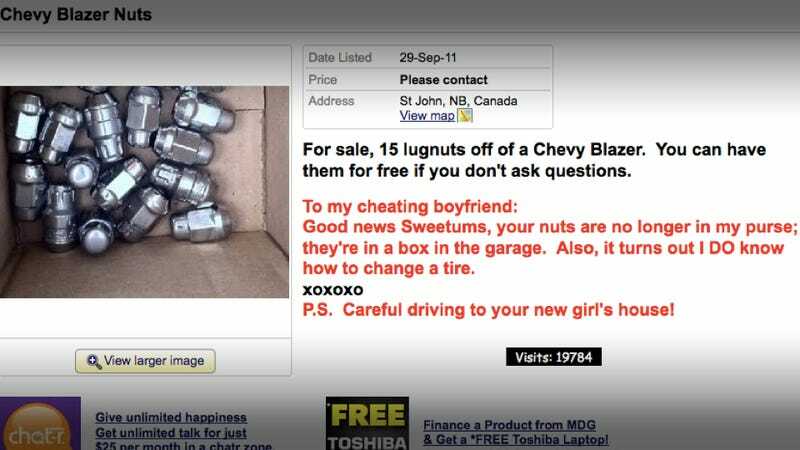 This Canadian classified ad seems to encapsulate just how stupid you'd have to be to be unfaithful to a girl whose mechanical ability you've recently insulted. We're not sure how this story of a wronged woman with a four-way lug wrench ends, but it's probably safe to guess the man who wronged her felt a sudden pang of regret as he rounded a bend en route to freedom, only to be felled by a departing wheel. Probably a metaphor in there somewhere.